The primary vessel used by the Vikings in their raids, the Viking longboat or longship was a good sign for anyone on shore that carnage was soon to ensue. The Viking longboats were visually beautiful with their ornate wooden carvings and designs. They had fearsome looking bows, often adorned with ferocious animal heads like dragons and would likely have struck fear into the land loving folks as they were rowing to shore. The Viking longboats were reported to have been nicknamed ‘dragonships’ by the English, who were the recipients of many a Old Norse raid. This nickname was just part of a lore and a fear that the Viking longboats would provoke, once the word of their raids began to spread. The Vikings used these longboats to become prolific invaders of many a foreign land. The Viking fleet would be made up a range of Longship classes and styles. It’s thought that as the raids grew in popularity and regularity, so did the fleet and boat sizes using by the old Norse seafarers. A Viking busse class dragon ship. 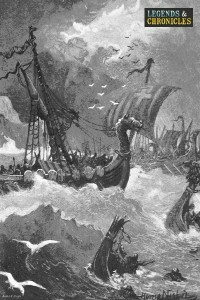 The Drakkar, or the dragon ship, was a term often coined by the subjects of the Viking raids, rather than the Vikings themselves. The Dragon ships could have been any of the other other classes, a Busse, a Snekkja, Skeid or a Karv. The distinction was that the Drakkar would have a animal head typically a dragon or serpent head stem on the bow. In some cases the animal design would have moved down to the stern as well, with a matching animal tail. This Drakkar design was thought to be reserved for the largest ship in the Viking fleets, the flagships boats that would head up the landing parties and raids. It’s thought that the name originated from this, when the raid subjects would spot the dragons ships off the shorelines, and fear would likely strike them. The Busse class longship was the most prestigious Viking warship, and likely most Drakkar ships were Busse ships. The Busse was big with sizes up to 50 metres, around 160 feet in length. Fitted with both sails and oars, a Busse could have up to 35 pairs of oars, allowing it to travel with speed utilising any propulsion method. The Busse was capable of carrying a large cargo, which was beneficial on large scale raids, where the Vikings would look to take as much treasure home as possible. The Busse was thought to have carried a crew of around 80 Vikings. The scale and size of the Busse also allowed the Viking raids to travel further afield. The larger cargo holds meant the journeys across the oceans would be feasible compared to the smaller ship classes. The Skeid class longship was a large Viking warship, almost as large as the Busse and much larger than the smaller Snekkja. The Skeid had a size of up to 30 metres, around 100 feet in length. Like the Busse, the Skeid had both sales and oars, with up to 30 pairs of oars to power it. As essentially the mid sized Viking longship, the Skeid was a sizeable ocean vessel. The Skeid was thought to carry a crew of around 70 Vikings. The Skeid was big enough to lead a raid to far off lands, and a Skeid was fully seaworthy and imposing. The Snekkja class longship was the second smallest of the Viking long ships used for battle or raid purposes. The Snekkja was thought to be up to 18 metres, around 60 feet in length. Oars and sails were used of course, with the Snekkja holding up to 20 pairs of oars. Despite not being the largest of the longships, the Snekkja was definitely one of the most common. The Snekkja is thought to have carried a crew of around 40 Vikings. Easier to build and still capable of carrying plenty of bounty, the Snekkja was probably the most popular Viking longship. 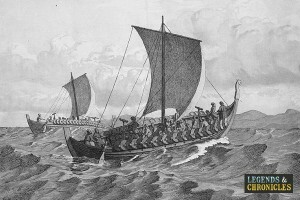 The Karvi class longship were the smallest of the Viking longships in overall size and would have been used in battle for small raiding parties. The Karvi ships were sometimes longer than Snekkja class ships, but were also substantially thinner. The Karvi ships would have had a varying range of oars, from 12 to 32 pairs of oars. Suitable for war, but obviously not as ocean worthy as the other wider longships, the Karvi was typically general purpose ships. The Viking longboat was the key to the Vikings success in travelling. The various classes of boat employed by the Vikings would of course have grown over time. Larger boats like the Skeid and the Busse would have been built as the results of successful initial raids. These larger ships would have allowed the Vikings to travel in larger parties, over larger oceans, of course helping them obtain their valued treasures.